Four generation picture taken in 1920. 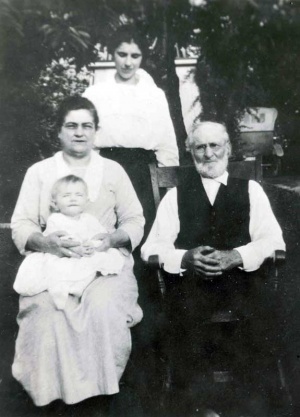 Seated: Clara Eby Steiner holding grandson Hugh Hostetler and her father Tobias Eby. Standing is daughter Charity Steiner Hostetler. Clara Daisy Eby Steiner, born 9 May 1873 to Tobias and Susanna Eby, was a founder and leader of the Mennonite [MC] Women's Missionary Society. The Society was the result of her conviction that women should and could play an active role in the church. For years Clara used her considerable abilities behind the scenes as a partner with her husband, Menno Simon Steiner in urban mission work in Chicago, Illinois, and Canton, Ohio, and then in church-wide work when M. S. Steiner served on various Mennonite Church (MC) boards. Clara's loss of an active role in the church when M. S. died in 1911 weighed heavily. Not only did she manage the farm and housework and raise her children but she responded to the call she felt from God to establish an organization for women. A few existent sewing circles served as the base, but Clara's vision went beyond sewing to the entire field of home and foreign mission endeavor. She wanted the society to diffuse missionary spirit among women and provide opportunity for their significant participation in church work through planning for and supporting women missionaries and mission projects related to women. The society flourished for a time despite great resistance to any executive role for women in the church. Clara understood the conservative forces and factionalism that kept the society from obtaining any official authorization and tried to work diplomatically but persistently. Finally, in 1926, the Mission Board appointed its own women's committee strictly for sewing work. Although the society attempted to continue the more important aspects of the work, it ceased to exist in 1928. On 10 December 1929 its influential founder died in Chicago. She was buried at the Zion cemetery near Bluffton, Ohio. Gingerich, Melvin. “The Mennonite Woman's Missionary Society." Mennonite Quarterly Review 37 (1963): 113-25, 214-233 passim. Klingelsmith, Sharon L. "Women in the Mennonite Church, 1900-1930." Mennonite Quarterly Review 54 (1980): 163-207 passim. Rich, Elaine Sommers. Mennonite Women: A Story of God's Faithfulness, 1683-1983. Scottdale, PA: Herald Press, 1983: 195-199. Klingelsmith, Sharon L. "Steiner, Clara Daisy Eby (1873-1929)." Global Anabaptist Mennonite Encyclopedia Online. 1989. Web. 23 Apr 2019. http://gameo.org/index.php?title=Steiner,_Clara_Daisy_Eby_(1873-1929)&oldid=112838. Klingelsmith, Sharon L. (1989). Steiner, Clara Daisy Eby (1873-1929). Global Anabaptist Mennonite Encyclopedia Online. Retrieved 23 April 2019, from http://gameo.org/index.php?title=Steiner,_Clara_Daisy_Eby_(1873-1929)&oldid=112838. Adapted by permission of Herald Press, Harrisonburg, Virginia, from Mennonite Encyclopedia, Vol. 5, p. 857. All rights reserved. This page was last modified on 12 February 2014, at 08:12.